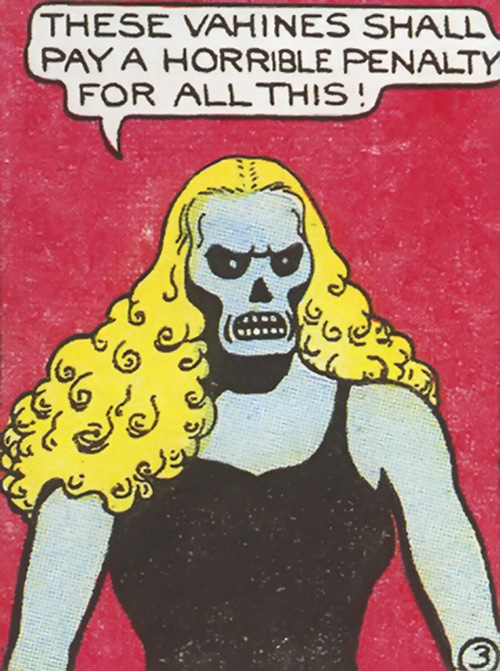 Fantomah probably was the first super-powered comic book heroine, and was one of the features of Jungle Comics during the early 1940s. 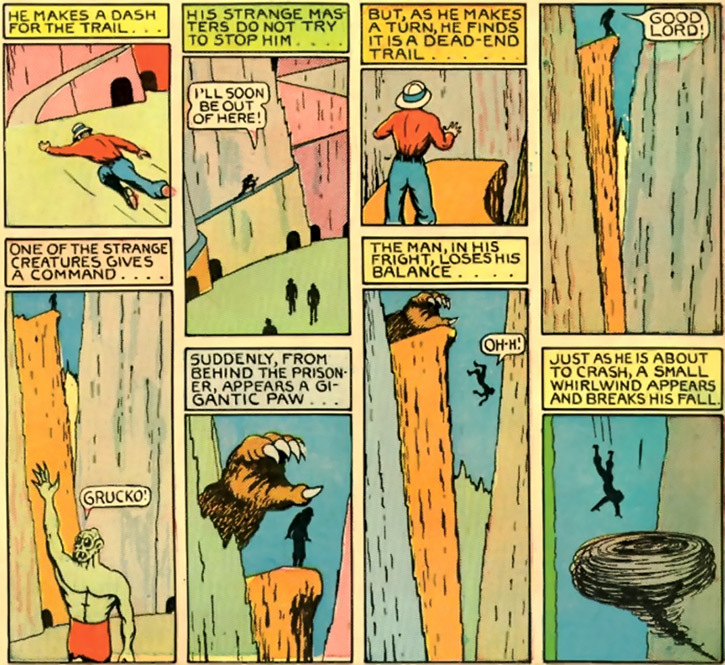 Yes, *all* the stories in these comics were about the jungle. She is a magical spirit of vengeance — not unlike the Spectre or the Ghost Rider, but with a 1940s glamour hairdo and a négligé. She kinda is the Black Widow (Claire Voyant) mixed with Lee Falks’ Phantom (aka the Phantom of the Bengal) and a huge dose of Rima the Jungle Girl. 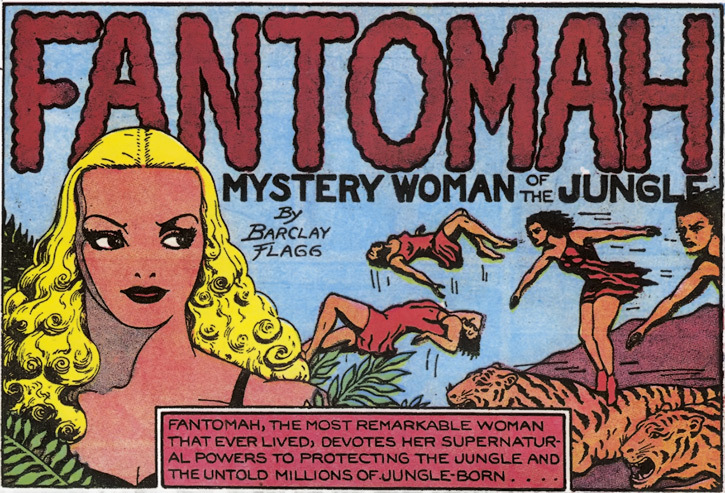 Though the stories are signed by the pseudonymous “Barclay Flagg”, Fantomah was actually one of the creations of Fletcher Hanks, a rather… peculiar writer and artist. Our Amazon recommendations explain and reprint his comic books career (and have awesome titles). This profile only covers the “Barclay Flagg” stories – Jungle Comics #2 to #15. 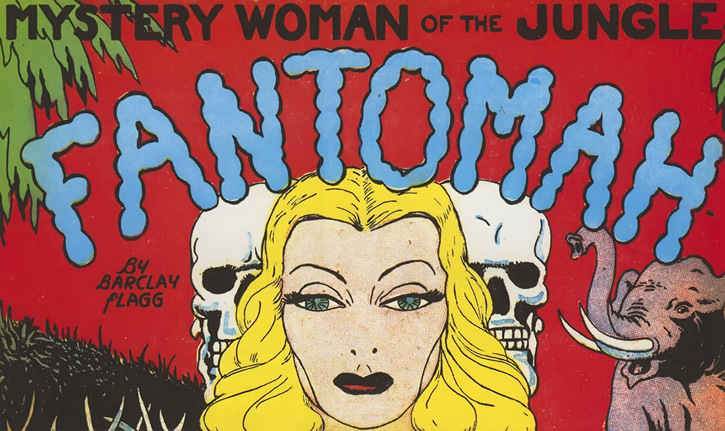 Other Aliases: Fantomah is called “Fantoma” or “Fantoman” on some Jungle Comics covers, because spelling is hrad. She is usually called “the most remarkable woman that ever lived” in the stories’ opening caption. Height: 5’4”; Weight: 120 lbs. Fantomah wields powerful and versatile magic-like powers. She’s one of those “can do whatever she wants” characters. Mystical awareness of anything that threatens “the Jungle”, particularly outside menaces. Flying around (once flying to New York City without hindrance). Creating matter (such as a mass of rock) out of thin air. Ignoring most language barriers and even talking to animals. Making animals blindly panic – or making them all docile. Assembling armies of disciplined jungle animals, though that takes time, and endowing them with the power of fast flight if she feels like it. She usually selects giant specimens. Paralyzing even the largest animals. Curing sickness (or even super-science brain serum alterations). Clairvoyance (that is, observing remote scenes). Turning men into disgusting monsters, perhaps permanently. Levitating tens of thousands of tonnes. Force people to perform certain actions. Ignoring gunfire (presumably by being intangible). Carrying one or more persons with her in flight (presumably via telekinesis). Turning men into monstrous humanoids, perhaps permanently. Physically and mentally combining four men into one. Taking control of a plane to make it crash-land. Emitting destructive rays capable of destroying light bombers. 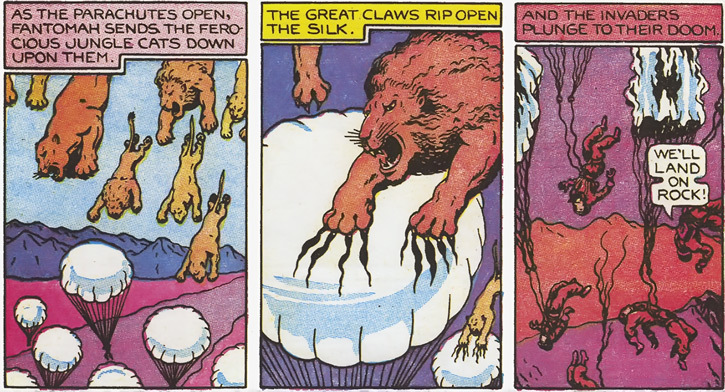 Suspending hundreds of giant panthers in the air (that was a good one). Flipping the flight trajectory of sadistic soaring sorcerers (always useful). Creating a gigantic scirocco over the Equatorial Atlantic. Conjuring great bolts of destructive lightning from the sky. Cancelling the effects of magical potions. Controlling the pace and trajectory of a tsunami. Shrinking (perhaps permanently) literally mammoth-sized spiders into tiny spiders. And of course turning her face (or her whole body) into a skeleton. Natives of “the jungle” are normally aware of whom Fantomah is. If they know they are in the right they will wisely stay away and let her do her thing. If they fear they are in the wrong, they will wisely run like hell. On the other hand, outsiders routinely ignore her. Even when she’s an obviously supernatural death-aspected manifestation, the bad guys always ignore her warnings and treat her as a non-entity… until she strikes. The fools !! In some captions, Fantomah’s powers are described as mental abilities such as “super-thought rays” and “super-willpower auras”. However, other captions describe it as “wizardry” or “magic will power”. 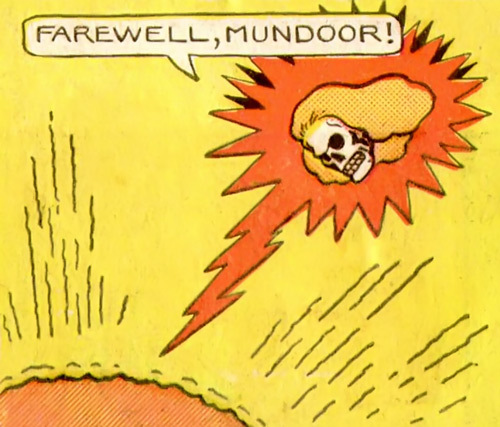 Fantomah seems to operate most of the time as an ethereal projection – an intangible apparition that can fly around, and appears and disappears at will. She can fully use her magic to affect the world around her, even though no mundane thing can touch her. This intangibility is *not* explicit in the stories, and may not be the authorial intent. But people react to her as if she weren’t quite there (unless they know of her power), she seldom physically interacts with anything, and early on her attire seems translucent (which is… odd given the era.). More tellingly, few people ever try to attack her even when she’s just standing there. 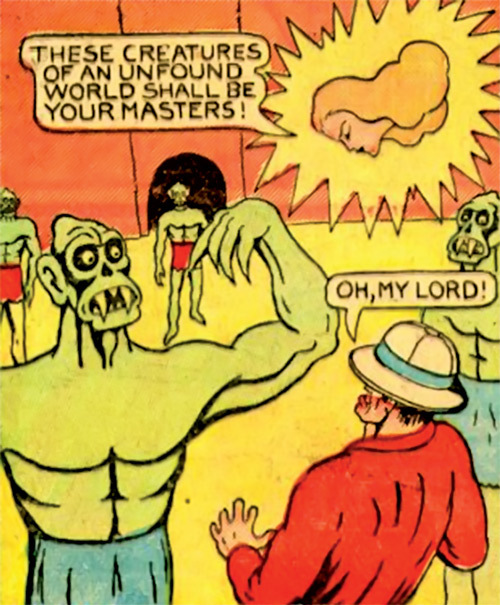 My guess is thus that people can see that she’s a sort of ghost or hallucination and treat her that way, but the relatively simple colouring and printing techniques of 1940 couldn’t convey that – albeit the captions never mention it either. The only recurrent physical interaction is when Fantomah grabs an evildoer and carries them to their doom (note that nobody ever tries to struggle free when that happens). I assume that she’s doing that telekinetically, levitating her victim next to her astral form and only appearing to physically grab them out of habit. When taking several victims, they just float in an aura of light surrounding the flying Fantomah. When Fantomah is affected by attacks, these are exotic energy onslaughts – and even these have very diminished effects on her compared to a normal person. She did magically knock out a guy trying to attack her with a knife, though (perhaps out of general caution). Deep in the jungleland, there is a gigantic pit where troglodyte monsters from an “unfound world” reside. Fantomah — and perhaps the local judiciaries — sometimes send killers there to be executed. The green, fanged humanoid residents have many caverns all filled with monstrous animals (such as throngs of giant white cobras), and can animate the very rock at will, usually to form giant clawed hands. The topography is irrational, the cliffside ramps never lead anywhere, and there are hostile gusts of winds (which the masters of the pit can also command). It seems possible the the Pit is actually another dimension. The “jungleland” also had a volcano where stony-faced silent humanoids lived without any belongings, and without ever doing anything except eating rock and magma. This may be related to the Pit, and Fantomah could turn men into such creatures. Fantomah demonstrated knowledge of, and power over, the Southern American jungles but they did not seem to be part of her turf. “The jungle” had many species of giant animals – usually twice the body weight of ordinary specimen, give or take. Giant lions, panthers, vultures and snakes were seen. Fantomah is a mysterious entity who protects “the jungle” from outside depredation, and particularly the greed of White imperialists. Nothing is known about her nature or her history. Apparently, Fantomah wasn’t active 2,000 years ago, since she had only heard second-hand of an attack against “the jungle” back in these days. “The Jungle” seems to be an indeterminate mishmash of various African and Indian elements (and elephants), with occasional Middle Eastern bits thrown in. Perhaps Fantomah operates from the Horn of Africa and “the jungle” means Sub Saharan Africa, North-Eastern Africa, Western India, Madagascar and some Indian Ocean islands. In Jungle Comics #12 we briefly see a map that indicates that Liberia is part of “the jungleland”. It also confirms that the story takes place on Earth (or rather, on a Earth). “The jungle” features an amazing amount of easily-accessible gemstones, drawing in greedy human predators who always wear colour-coded pith helmets. It is also endowed with some sort of “primal purity”. The later is not explicit in the story, but “the jungle” keeps being presented as a place of innocence, peace and communion with nature. Having two criminals perish after discovering the legendary Elephants’ Graveyard. Stopping two criminals robbing a sacred city, and sending them back as horribly mutated monsters. Stopping a mad scientist by terrorizing his enhanced simian troops, having them rip the scientists to shreds, then cancelling the effects of his gorilla-brain-enhancing serum with her “jungle restorative ray”. Stopping a mad scientist who had discovered a “super-vitamin plant” on a fallen asteroid, and used it to grow alien giant lizards to kaiju -like proportions. 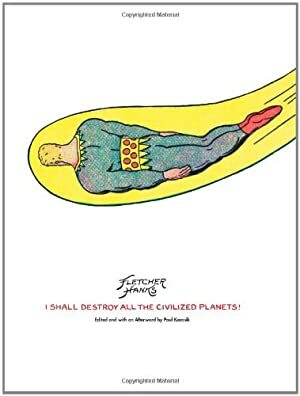 After he attacked a rich city, Fantomah took him to the asteroid, forced him to eat a “super-vitamin plant” and exiled him into space with the asteroid and lizards. Stopped a Tarzan expy and his giant snake after he ate cursed berries and became an evil magician. Fantomah undid most of the damage and had him eat magical herbs to undo the berries’ effects, then exiled him on a remote plateau. See our profile for the “jungle demon”. Captured four men who had taken over a mine with imprisoned natives and gunned down the legitimate owners. Fantomah then dropped the criminals into the dreaded Pit of Jungle Horrors. Captured a White medler who had stolen a sacred mask, thus causing great waves of boiling mud to magically rise and start to engulf the jungleland. After returning the mask and stopping the mud, Fantomah turned the man into a sort of rock-eating zombie living with similar creatures within a volcano. Intervened in New York City when a madman attacked it with bombers then released through the city giant panthers captured in the jungleland. Fantomah flew in, downing the bombers then returning the panthers to the jungleland after storing them suspended in mid-air as she recaptured them all. She then turned the madman into a caveman and left him alone, armed with but a club, among the repatriated giant panthers. Defeated Arco the super-scientist from Ancient Egypt as he and his mummy people invaded “the jungle” thanks to a powerful blinding ray. Thwarted (implicit) Nazis who built a large air base in Liberia to invade Brazil, and from there the US. Though they enslaved many jungle natives and killed some, Fantomah waited and prepared until they launched their flight above the Atlantic. She then caught them into a huge scirocco that made them lose control, sent an army of levitating great cats to attack paratroopers in mid-air, crashed the remaining planes in Brazil, and sent an army of Brazilian dinosaurs after the wrecks. Once it was done she had the dinosaurs return to their hiding place, turned her army of flying great cats against Brazilian Nazis, then soared with her flying felines back to Liberia to lay waste to the base – and finish it with bolts of lightning. Fantomah wills it ! Destroyed the Vahines — the tiger-women of Wildmoon Mountain — when they decided to destroy all other women in the world, starting with the natives of “the jungle”. Stopped the killer tsunami raised by Zomax, the “demonized marine scientist”, against the jungle animals – and sent Zomax careening to his death into the wave. Took out Org with his hypnotic drum and his giant spiders after they slaughtered much of a city and an entire village. This is a 1940 US comic book, so Fantomah simply has to be White – even though she clearly considers “White men” to be unwanted outsiders who are probably going to cause bad trouble (see our Ace Harlem profile for an atypical example of a 1940s Black comic book hero). 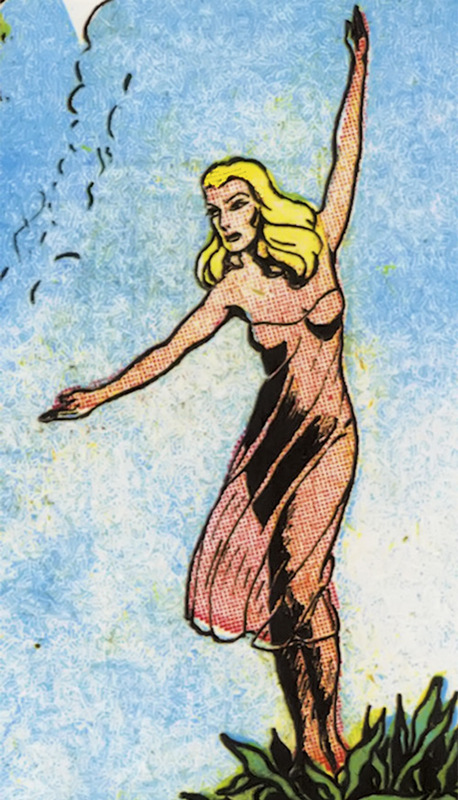 She is originally clad in a dress that seems at least partly translucent (though of course her body isn’t actually detailed in the art, since this is still a 1940 US comic book since the previous paragraph). This soon evolves into a very short LBD with a translucent skirt extending the minidress’ length to the knees – perhaps a sort of négligé. Sometimes the translucent part is tinted red. 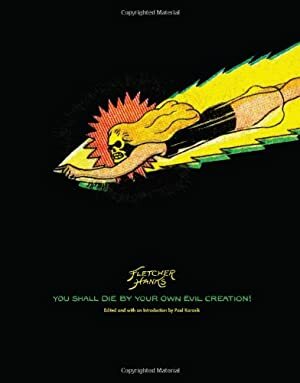 From the rest of Fletcher’s history, one suspects that the changes to Fantomah’s dress were requested by editors. One of her schticks is to turn her face into a skeleton – sometimes a green or blue one, and often giving off a sinister magical glow. Her hair is unaffected, resulting in a odd and ghastly sight. She often manifests as just a floating head and hair with the skeleton face. When Fantomah goes macabre, this means that she is about to strike or, at best, give a final warning (that will be stupidly ignored). Fantomah’s usual modus operandi is to assess what is happening with her mystical senses, appear on the scene as the criminals are about to commit the deed or are in the early stages of their rampage, and warn them of terrible consequences. People almost always ignore her warnings and do bad things, at which point she turns her face into a skull and uses her magic to enact grotesque retribution. She only acts once damage has been done (though she’ll sometimes use her spells to repair most of it). It thus seems likely that she is bound by some sort of mystical rules of engagement. She might only be able to act in the name of vengeance, so somebody has to actually do a bad thing first. It seems possible that she cannot act against the bad guy until an innocent has been killed, though some animals apparently count. She can act to prevent carnage if she can reach the scene in time, but apparently she cannot strike against the evildoer until someone actually died. The story aren’t consistent about that, but it’s a decent approximation. 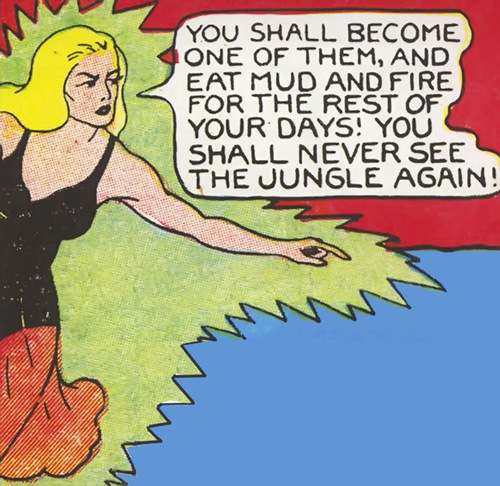 Though Fantomah once saved New York City, her dialogue indicates that her goal was to save the captured giant panthers of the jungleland, not New Yorkers – who are presumably not her responsibility. She stated a few times that her role was to “protect the jungleborn”. 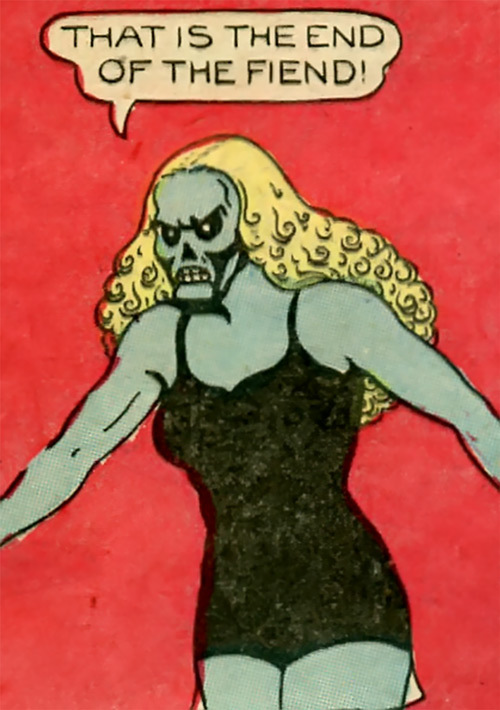 An important aspect of Fantomah are her elaborate, cruel and sort-of-poetic vengeances upon evil-doers. She usually has the jungle kill her enemies (often through wild animals), and they always die terrorized and in great pain. Fantomah’s vengeance leaves no stone unturned, often sees spectacular displays of power, and seldom repeats itself. 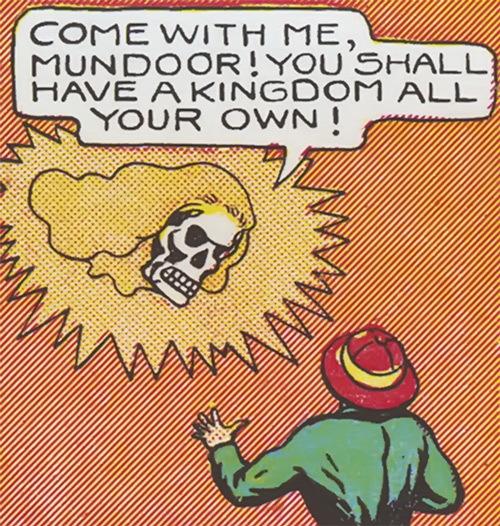 Fantomah would be an unusual form of a Ghost Rider, since there were many such skeletal spirits of vengeance across the centuries and continents. Fantomah is very reminiscent of the Spectre, and she’s an exact contemporary of his (by cover date they debuted on the same month of the same year). One possibility is to push her adventures to the turn of the XXth century (say, 1850 to 1935) and have her be the first host of the Spectre before Jim Corrigan, after Eclipso’s fall. She eventually chose to pass on, and a few years later Corrigan was killed and became the new host. Awareness only extends to “The Jungle”. Fantomah can use her Gravity Decrease on a large object, then emulate Telekinesis with Sorcery to manipulate it. Sorcery has a selective 2 APs Area of Effect. She can extend that at the cost of 1 AP of active Sorcery per additional 2 APs of Area of Effect. Sorcery can have a Special +8 Duration Bonus where applicable, if Fantomah wills it. Spirit Travel being Self-Linked means that her body isn’t left behind – it travels intangibly along with her spirit. OV/RV of Sorcery are 1 CS higher if the player cannot justify the spell as having something to do with jungles. Animal Handling is presumably limited to animals of the jungle. Area Knowledge (“The jungle”; Junglelands outside of the “the jungle”), Expertise (History of “the jungle”), Insta-Change (to a more macabre form), Mystique (Natives of “the jungle”), Sharp Eye. The Pit of Jungle Horrors (Low). Magician’s Code, Socially Inept; Misc. 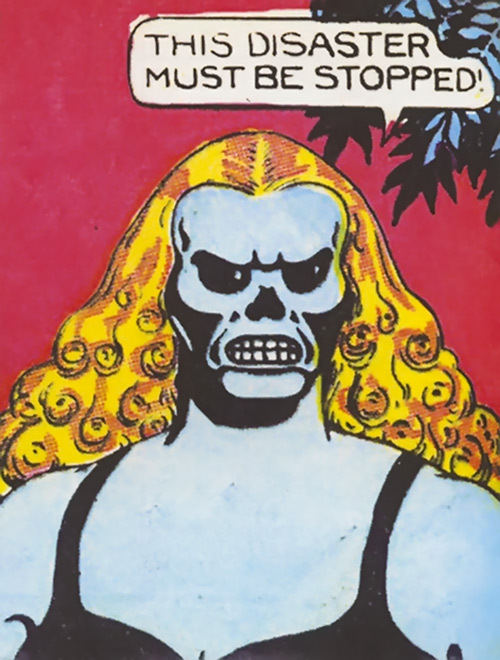 : Fantomah apparently has to follow certain rules of engagement – see the Personality section. Source of Character: Jungle Comics (Fiction House). Writeup completed on the 11th of September, 2015. I shall destroy all the civilised planets!